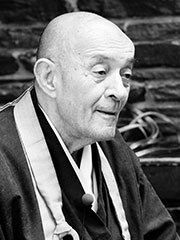 John Daido Loori, Roshi («Daido Roshi» for short), is an artist and first generation American Zen master. He is currently the abbot of Zen Mountain Monastery, located in the Catskill Mountains of New York. This monastery is also the mother-house of the Mountains and Rivers Order of Zen Buddhism, an American order founded by Loori in 1980. Daido Roshi received transmission in both the Rinzai and Soto Zen traditions, and combines aspects of both in the Mountains and Rivers Order. He is a direct dharma heir of Taizan Maezumi, Roshi, and the author of many books on Zen Buddhism. His art includes paintings and photography, and he incorporates creating art as a form of Zen practice. He studied the art of photography with the famous photographer Minor White. His art has been exhibited in many prominent venues, including the American Museum of Natural History. Daido Roshi is also a trained scientist, a background that informs his strong advocacy for wildlife and environmental protection. Sitting with Koans : Essential Writings on the Zen Practice of Koan Study with Tom Kirshner. The True Dharma Eye : Zen Master Dogen’s Three Hundred Koans with Kazuaki Tanahashi (Translator). Making Love with Light, a book of nature photography.